Hello!! Stopping in with two cards to share. First up is a card for the soon to be closing July Reverse Confetti Sketch for You to Try and Color Throwdown. Every month I think I will get my card for the RC sketch challenge done early and then every month the same thing happens... I get it done days before the challenge closes! Maybe one of these days I will get it done early, lol. I used the super sweet RC Love Blooms stamp set and the matching dies along with the RC Topped Off Tag Confetti Cuts. 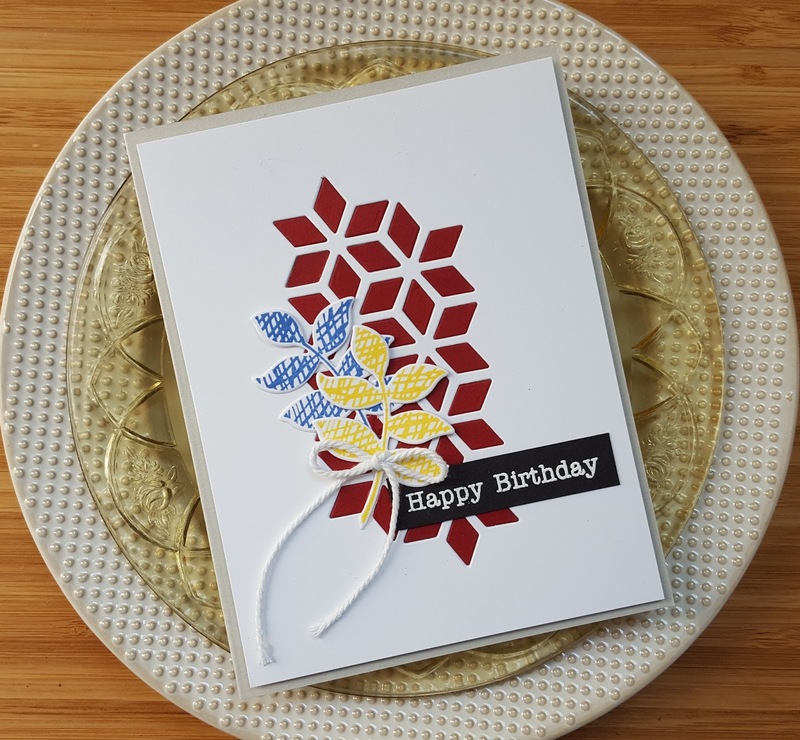 I stamped the outline flowers with the yellow and raspberry pink inks and then did second generation stamping for the solid portions. 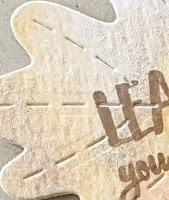 Once that was done I stamped the leaves and die cut everything. 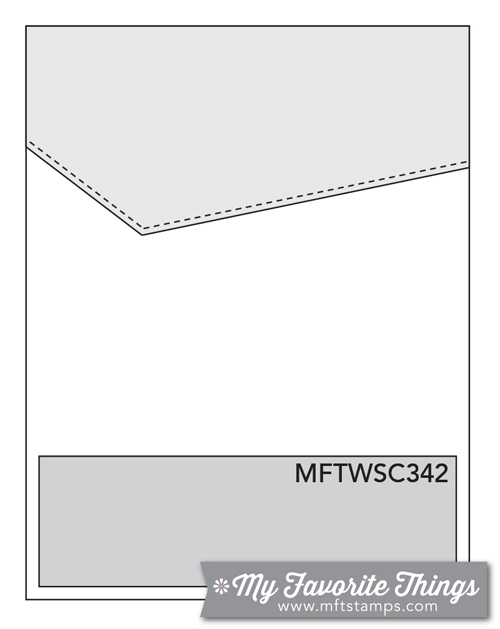 Strips of cardstock in the same colors were cut, adhered to a white cardstock panel and the die cut with a rectangle die. Die cut the tag from white, the top part from yellow cardstock and then adhered together. I stamped the sentiment and then adhered the flowers and leaves. Layered everything up and I was done. Next is a card for the current Freshly Made Sketches challenge and the Simon Says Stamp Wednesday challenge of anything goes. 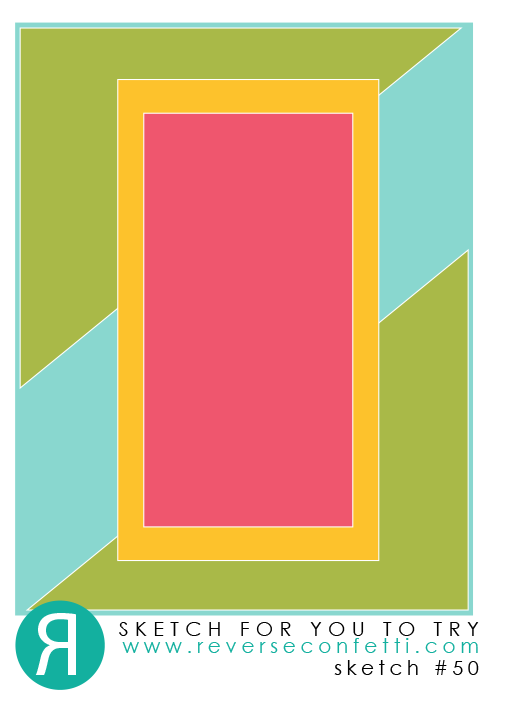 I used some of my favorite A Jillian Vance Design dies to create the diagonal portion of the sketch. The dies I used are the Leafy Vine die, the Daisy die and the Wildflowers die. Trying to use up more of the patterned paper I have so I used some older papers from My Mind's Eye. 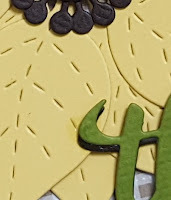 I used the two smallest flowers in each die set to create my flowers. 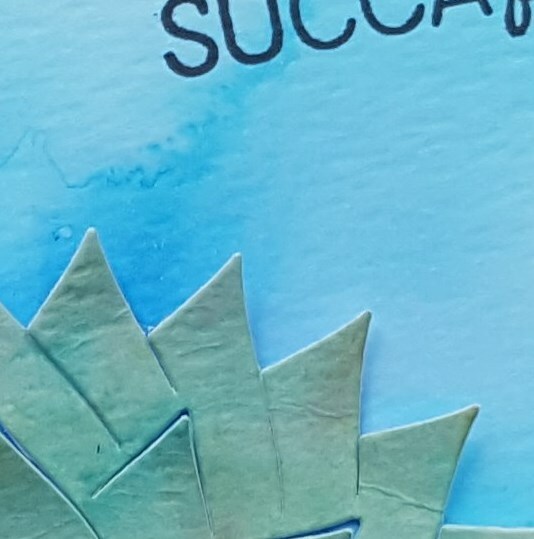 The vine was die cut twice from different papers, the bottom one cut into two pieces and then adhered to the panel that was die cut from more of the patterned paper. I layered over the intact vine and then added the flowers. I really like how the two different flowers look layered together and played on top of the vines. The sentiment is from the AJVD Darkest Night stamp set and was stamped in dark blue ink. I used some fun new AJVD products so I hope you will check it out! Have a wonderful day!! 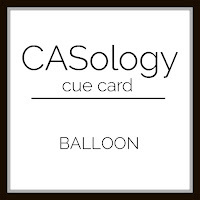 CASology 5th Anniversary Blog Hop!!! times of my crafting life! So when Melissa contacted me about being a part of the celebration I had to say yes, again!! All the fun starts on the CASology blog. 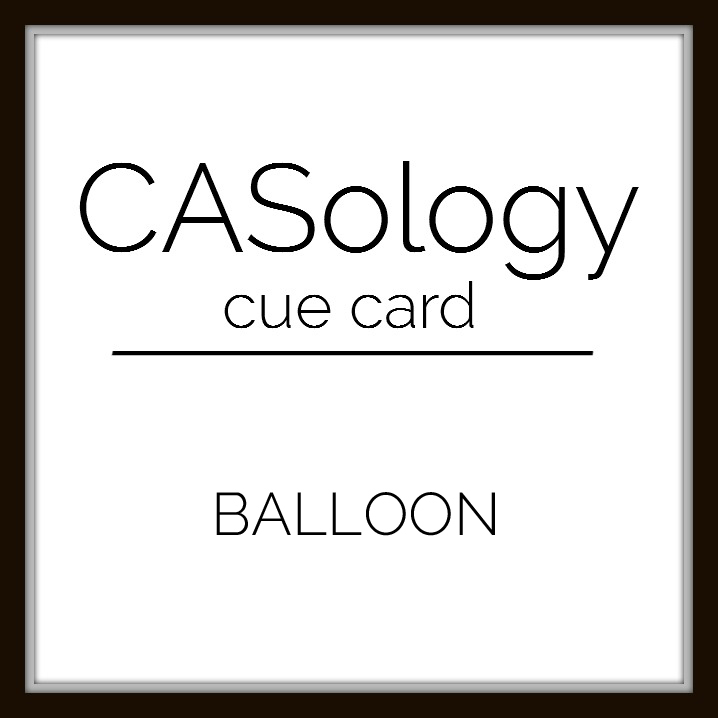 If you came from CASology design team member Joyce's blog then you are on the right track. If not head over to the CASology blog for a list of all the hop participants. The cue word for this challenge is appropriately balloon. For my card I used the super fun Essentials by Ellen Up the Happy stamp set along with the matching dies. 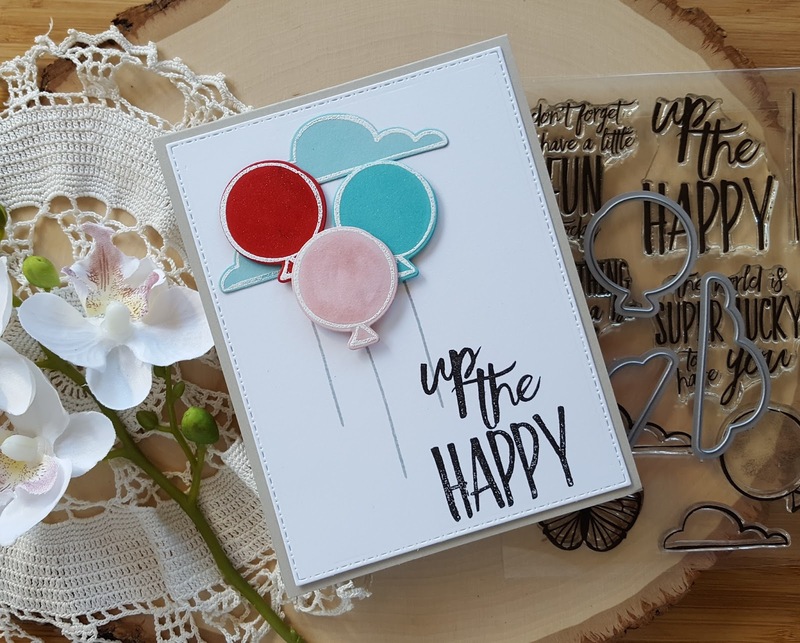 I heat embossed red, aqua and pink cardstock with white embossing powder them and then die cut the balloons with the matching die. The same thing was done for the clouds as well. I then adhered the balloons and the clouds and added the balloon strings and the sentiment. And here is what you can win!! How amazingly awesome is that??? Pretty darn awesome in my book!! Your next stop on the hop is the blog of STAMPlorations one of the awesome sponsors of the CASology celebration!! 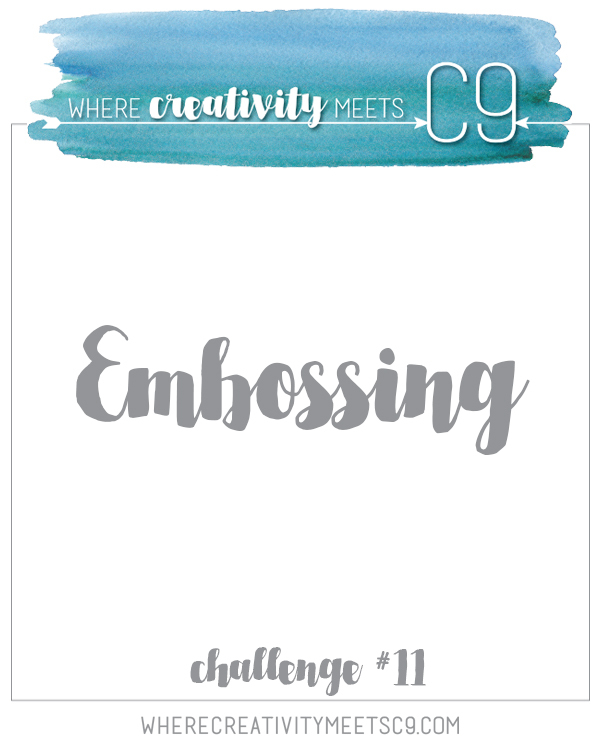 The color scheme for my card comes from the current Essentials by Ellen Pin-Sights challenge so I will be linking my card up there, as well. 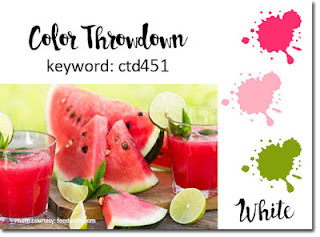 When I saw the pin-sights challenge inspiration board I knew it would be perfect to use to create my card for CASology... just look at those fun colors and images! They just say balloons to me! Hello!! 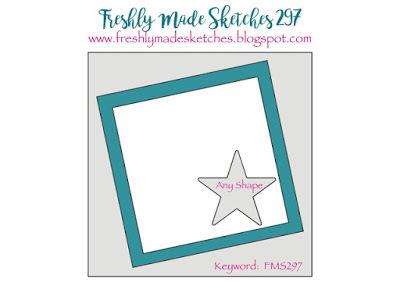 Things have been a little crazy in my house, but I did find sometime the other day to make a card for a couple of challenges: Freshly Made Sketches and Simon Says Stamp Wednesday challenge - seeing stars. 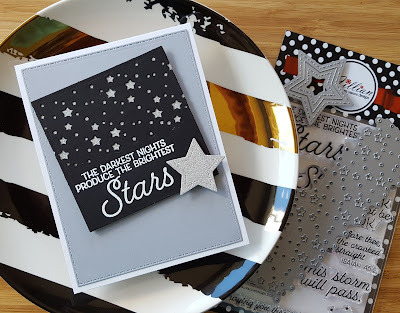 I recently got some new goodies from A Jillian Vance Design and one of the items was the new Darkest Night stamp set. I paired it up with the really fun AJVD Scattered Stars Strip die and the small star from the Stitched Dot Stars die set. 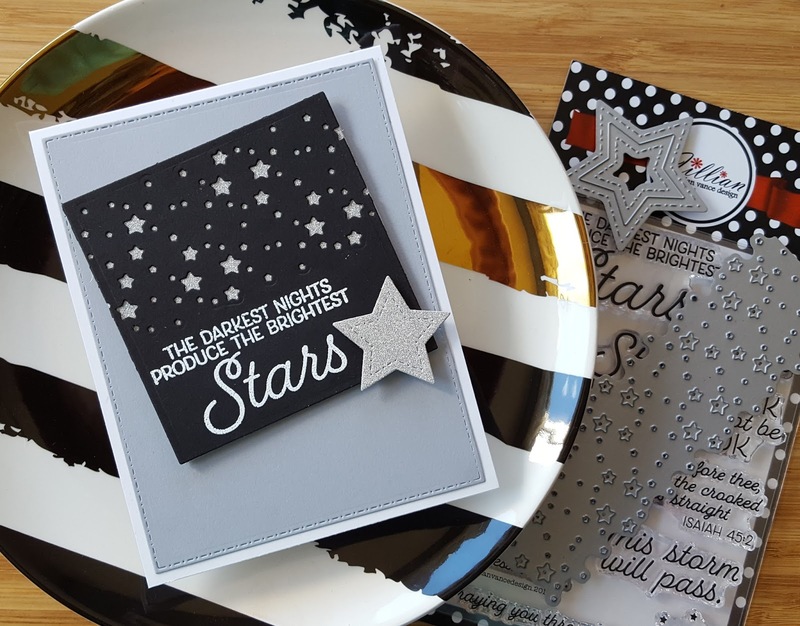 I die cut some black cardstock using the Scattered Stars Strip die and then die cut the piece with a square Spellbinders die. Silver sparkle cardstock was die cut with the same Spellbinders die and then adhered behind the black square. 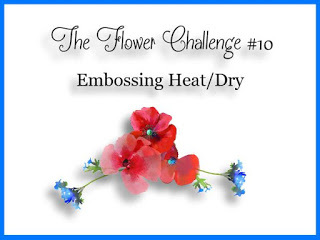 The sentiment was then stamped in VersaMark and heat embossed with white embossing powder. Originally I was going to just adhere the square to the white cardstock base, but decided the add the light gray cardstock panel for a little extra punch. I adhered the square and then added the little silver star to finish things off. 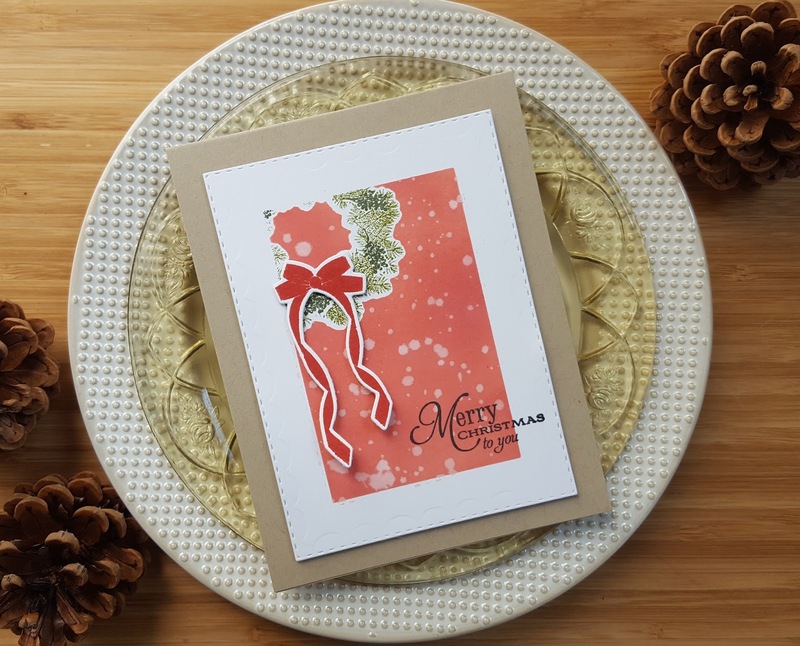 Hey... stopping in with a card for the current MFT sketch challenge, as well as the current MFT color challenge. 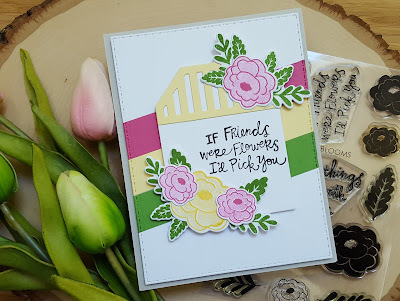 I pulled out the beautiful MFT Sketchy Blooms Two stamp set and the fun MFT Friend die. I stamped the flowers using the coral and teal colors from the MFT palette and then die cut the piece. I die cut the friend from the gravel gray cardstock four times and then stacked them. The letters were then adhered to the card front per the sketch. 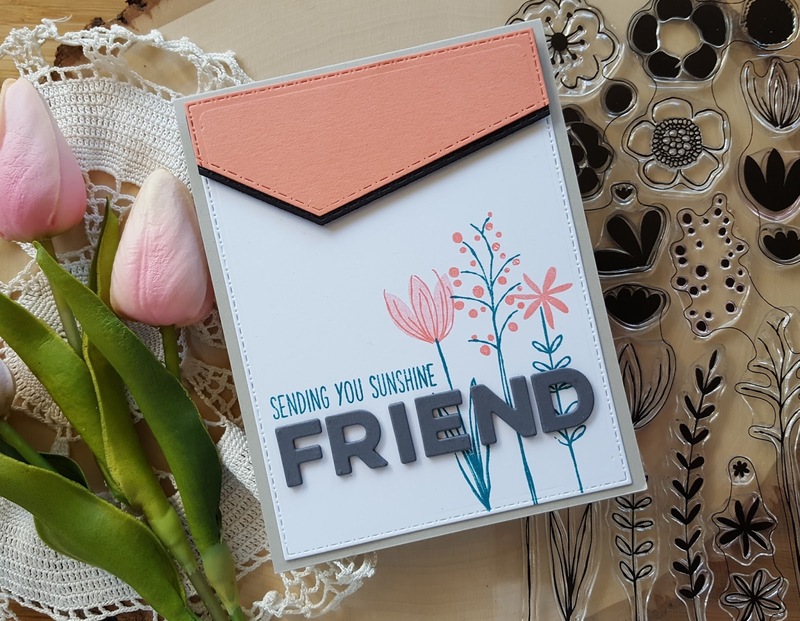 I die cut coral and black cardstocks with an angled border die, layered them as you see and then adhered to the card front. Finished things off by stamping the sentiment from the cute MFT set Sweet Forest Friends in MFT's Tropical Teal. Super happy with how this turned out... especially getting all the letters in friend lined up perfectly!! 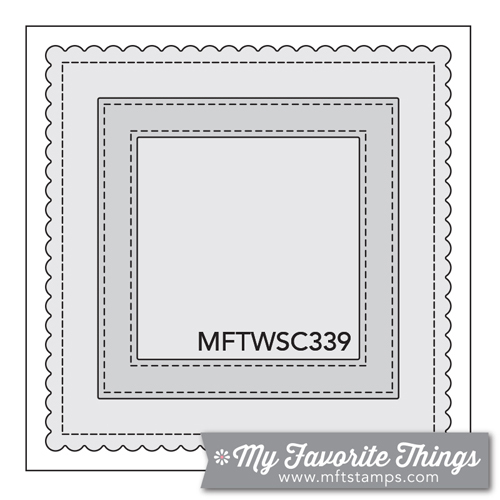 Supplies: Cardstock: light gray, white, MFT coral crush, gravel gray, black; Stamps: MFT; Dies: AJVD; Inks: MFT and Stamping Up! Hope you will hop over a look. Have a wonderful day!! Hey there!! 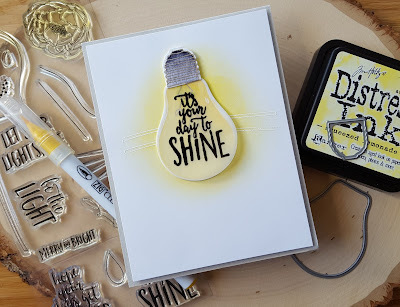 Popping in with a card for a couple of challenges... MFT sketch challenge and Simon Says Stamp Wednesday challenge to use plaid. 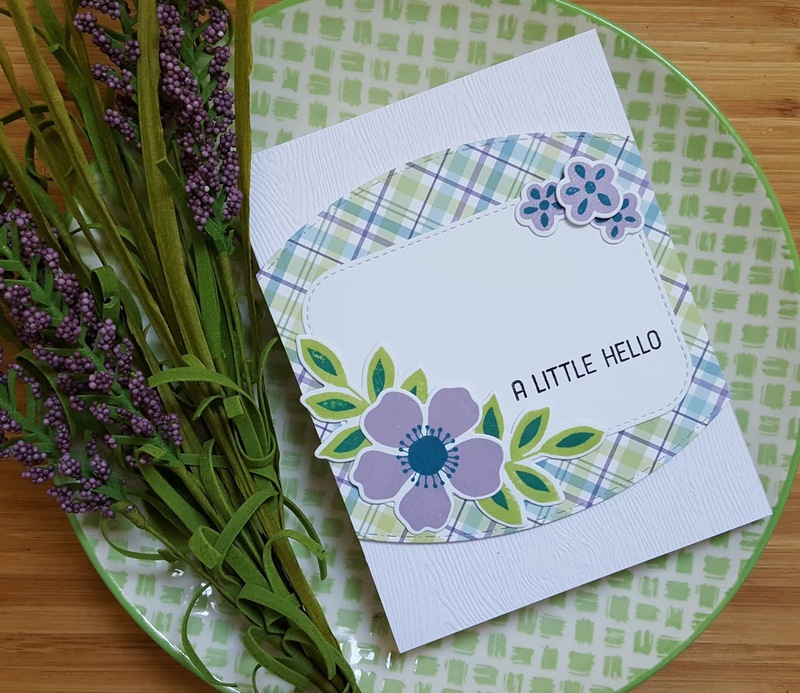 Love plaid and MFT has some super cut plaid paper pads. I used the Plaid Patterns pad as the starting point for my card. I pulled out this pieces with blues, greens and purples on it. 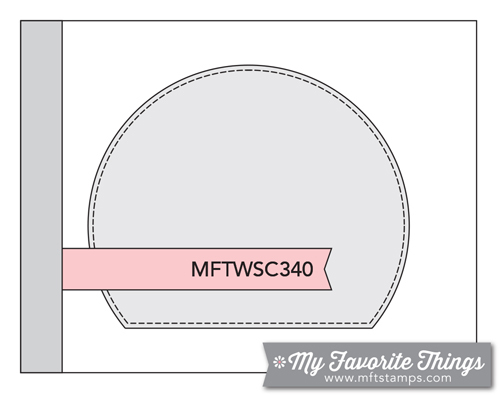 I then paired it up with the MFT Flashy Florals stamp set. I die cut the plaid paper and adhered it to a panel of woodgrain cardstock. 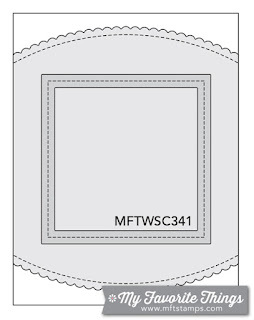 The small white panel was die cut using an MFT Inside Out rectangle die and adhered to the plaid piece. The flowers were stamped using a light purple ink and the centers were stamped with a teal. 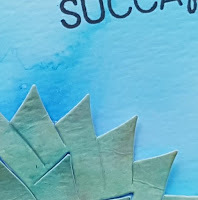 The leaves were stamped in a bright green and teal accents added, as well. Die cut everything and then adhered it to the die cut panel. Finished by stamped the sentiment from the MFT Springtime Blooms set and adhering the entire panel to my card base. Hey!! 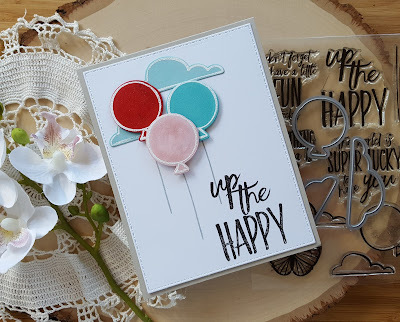 Popping in with a card for the current Color Throwdown challenge and since I embossed the sentiment I will post it to the current Flower challenge, as well. 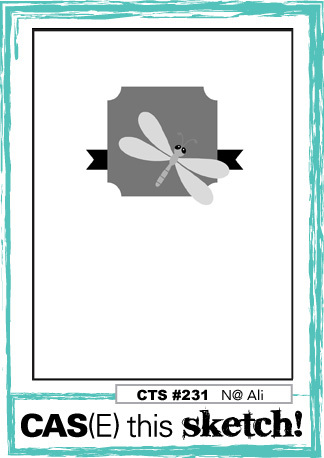 Using another new stamp set that I recently got from Stampin Up! This one is called Tranquil Tulips and has a watercolor look to it. 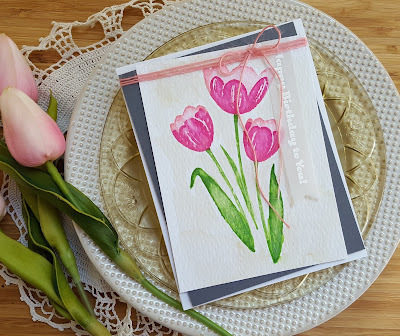 So I stamped the images on watercolor paper with distress inks (Worn Lipstick and Picked Raspberry for the flowers and Mowed Lawn for the leaves) and then blended the colors out with water. Before stamping the dark shade of pink I let the light value dry so that things didn't get to muddy looking. Once the flowers were dry I added a light wash of Old Paper distress ink to the background. The panel was trimmed down and then adhered to a panel of dark gray cardstock at an angle. 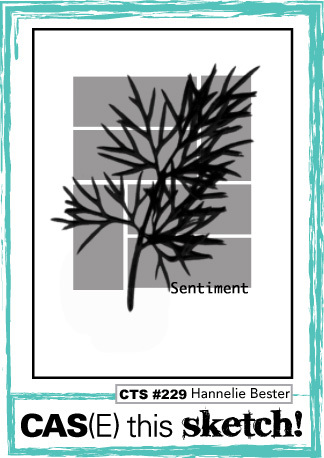 The sentiment (also from Stampin Up!) 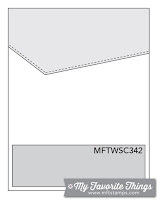 was embossed in white on vellum and then die cut with an MFT Fishtail Flag Stax die. I adhered the flag and then wrapped the panels with light pink twine before adhering it to the white cardstock base. I hope you will hop over to the AJVD blog for a full look at my project. Have a wonderful day!! Hey! Over the weekend I made a card using the new dies I got from Stampin Up! I must admit that I was a little dismayed with some of the dies in the set. 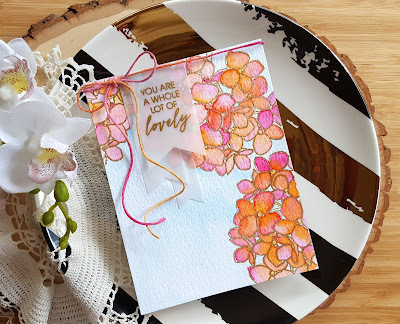 When I used the large die that you seen behind the flowers I saw that it just cuts out the little diamond bits as you see can see in this card I made and posted a few days ago. A few days later I realized that I could actually trim the piece out to create a different look. So for several days I had this piece floating around and over the weekend I decided to make something with it. 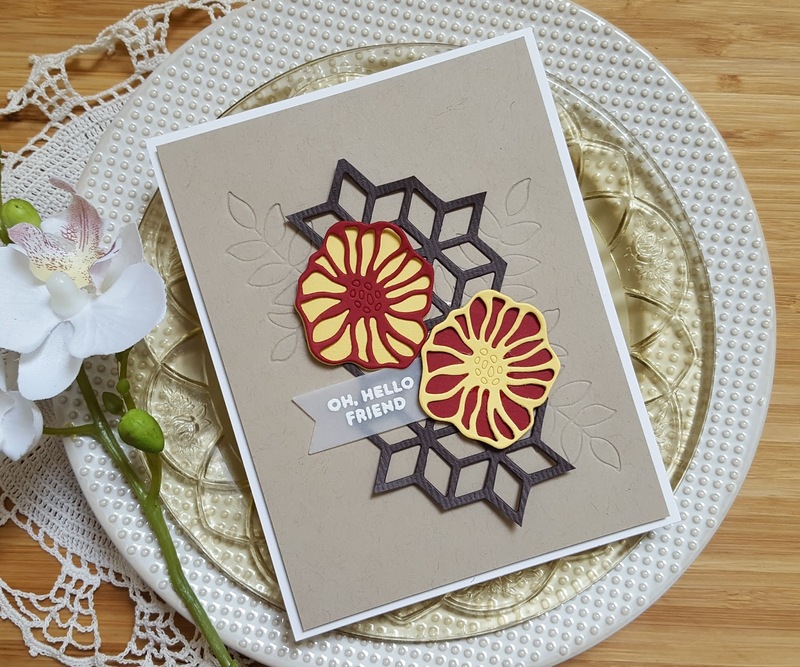 I had some cardstock left over from making the card I mentioned above so I used that to make the flowers with two other dies from the set. There was another die that puzzled me, as well. 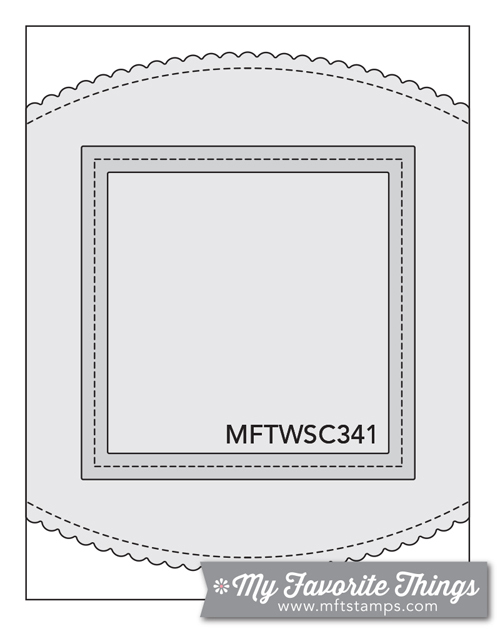 It is the little leafy one that you see embossed into the cardstock. When I went to use it I thought it would die cut this cute little leafy bit, but when I was done saw that it only embosses! Initially I was disappointed, but then I used it to make my card and now I actually think it is kind of clever. Anyway, here is my card. 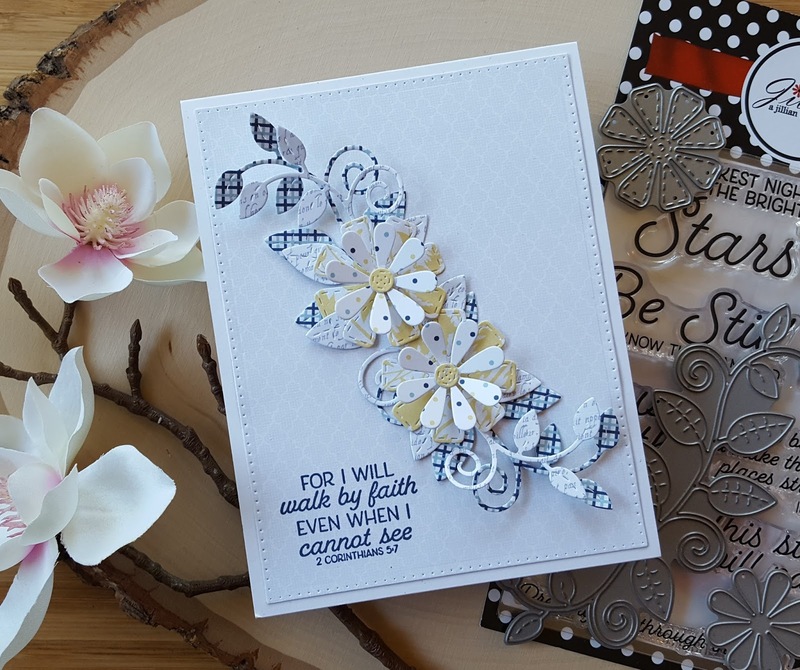 The sentiment is from the stamp set that coordinates with the dies and was embossed on vellum. I'm going to post it to CAS(E) this Sketch since the layout is based on their sketch, as well as CAS on Sunday. This is pretty clean and simple and it does have flowers on it. Hello!! As my blog title says... I have two cards to share today. 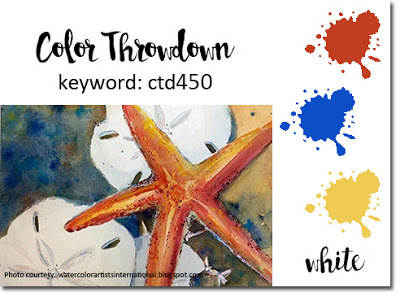 First up is a card for a couple of challenges: Color Throwdown and CAS(E) this Sketch. I recently got a new stamp and die bundle from Stampin Up! and have been wanting to use them. I thought the CTS was perfect way to give them some love! The die set comes with this really cool die that you see behind the two leafy stems. I centered the die on my white cardstock and then die cut the piece. Some red cardstock was die cut with the same die. covered the back side of the white panel with washi tape and then inserted all the little red pieces. The leaves were stamped in blue and yellow and then adhered to the panel. The sentiment is from the AJVD Happy Birthday stamp set and was heat embossed in white on black cardstock. The sentiment was trimmed down and adhered along with a little white twine blow. Mounted the panel on a light gray card base and I was done. Second card is for the current PTI MIM challenge of combining stenciling and masking. I usually take a look at the MIM challenges and often think that I will play along, but most of the time don't ever get anything done. But I had some time today and decided to give the technique a try. Early this year I finally was able to buy the PTI set Deck the Halls and thought I would use it for the challenge. I created my rectangle stencil using the middle die from the Double Up die set and obviously the wreath using the wreath die from Deck the Halls. The panel was inked with Ranger Distress Oxide ink in Fired Brick and then splattered with water. I stamped the wreath using olive and artichoke colored inks and the sentiment in black. I then die cut the panel down with the largest die in the Double Up die set. The bow was die cut and then stamped with a ruby red ink and then adhered with a little piece of foam dimensional. The panel was then adhered to a kraft cardstock base. 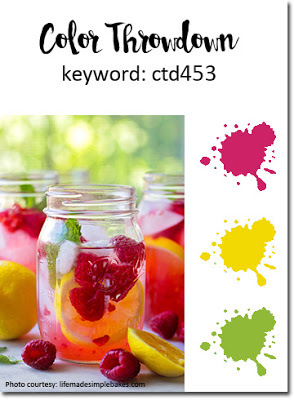 I'm going to add this to the Merry Monday summer link up. They had a previous challenge to use a wreath on your card. Hello!! The weekend is upon us and I have a card to share. 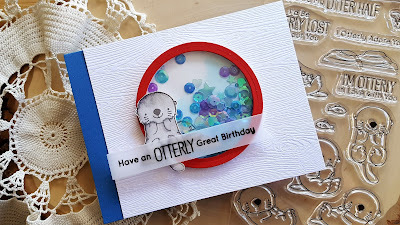 Last week I made a card using the super cute MFT Otterly Love You stamp set. I made the card for last week's MFT sketch challenge, but for some reason did not get it posted in the gallery... grrr!! So When I saw this week's sketch I thought I would make another shaker card using the same set. I used a different otter image, but I did use the same sentiment as I'm still in birthday card making mode, lol! I also used a few other images from the set, but kind of covered them up with the shaker mix that I used. 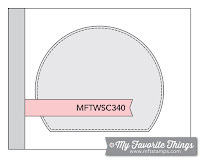 I will also be posting this to the current MFT color challenge as I used those colors, again, for my card. I have been practicing my watercoloring in an effort to get better at it. I decided to give Bristol cardstock another try and had much better results with it. I will also add this to the current Simon Says Stamp Monday challenge to use red, white and/or blue since I have used all three colors on my card. 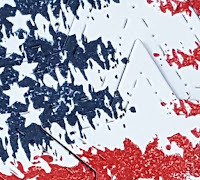 happy 4th of july... blogging on the ajvd blog today! 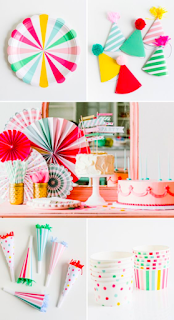 Hope you will head over to the blog for a look! Hey... happy day before 4th of July!! Got a card made for the current Essentials by Ellen pin-sights challenge. The inspiration photos are gorgeous, but given that it is now summer and there is stuff to do I wasn't certain I would get anything made. Thankfully I was able to get some time over the weekend to get something make. I had an idea as to what I wanted to make and the end result is close to what I was thinking. As I spied some gold accents in the photos I decided to emboss the Mondo Hydrangea in gold and then watercolor it using dark pink and orange. Once everything was dry I added in a really light wash of blue. Because I liked the entire panel I decided not to trim it down, but adhered the entire piece to my card base. I stamped the sentiment from the EE Lovely stamp set on vellum and heat set in gold. The sentiment was then die cut with an MFT Fishtail Flag Stax die. I die cut a couple more flags from vellum, layered them together and adhered to the panel. Finished with some variegated hemp twine and little dots of Nuvo Jewel Drops in Limoncello. Super please with how this turned out! Since there is still time I'm adding this to the current Simon Says Stamp Wednesday challenge of anything goes. Hello!!! 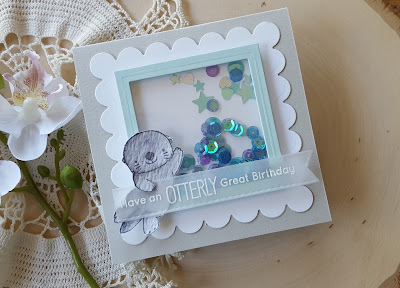 Have a little birthday card to share that I made using the super cute MFT stamp set Otterly Love You. I have wanted that set for ages and when MFT had a sale recently I finally made it mine!! 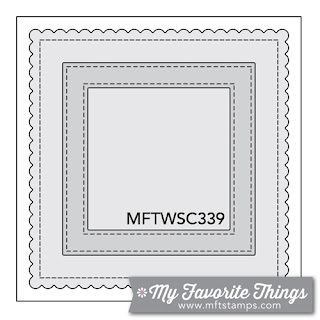 I followed the current MFT sketch for my layout so I will be posting it there and at Simon Says Stamp Wednesday challenge of anything goes. I have started watercoloring again and it has been a bit of a struggle. I have come to the conclusion that I'm just overthinking things and need to just relax! Anyway after several attempts I got a little otter I was happy with. Since the sketch is pretty simple I decided to make a shaker card. 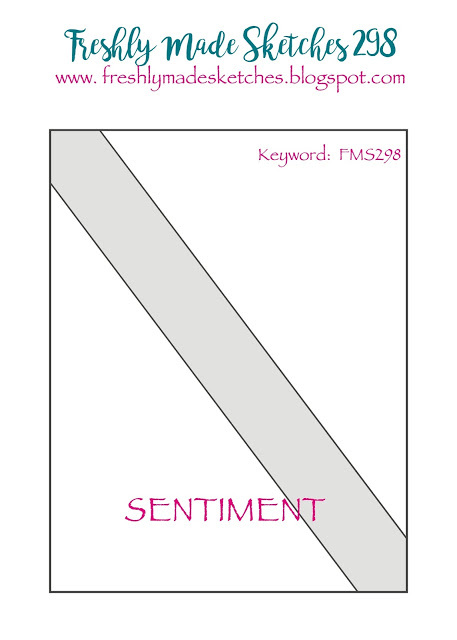 Once that was put together and adhered to the card front I had to figure out how to attach the sentiment. I stamped the sentiment on vellum with watermark ink and the heat embossed with white embossing powder. The sentiment was then die cut with an MFT Stitched Fishtail Flag Stax die. After trying just laying the banner on top of the otter I decided to cut around the otter's lower arm so that it would look like he was hold the banner. I slipped the banner under the arm and adhered it with Multi Matte Medium and then adhered the whole thing to the shaker element. Plain and simple, but rather cute I think!